Some of you out there might be wondering what, exactly, a car is. Scientists might waffle on you as to a strict definition, but I in my professional opinion can state as an example that this, the Plymouth Satellite, is a car. Look at it. Definitely a vehicle that can only be described as ‘car.’ This Plymouth Satellite is not the only car, to be sure, and not all cars are like the Plymouth Satellite. Certainly a 1960s and ‘70s midsizer coming in hardtop and convertible, later sedan and wagon form is not representative of all cars. Only a madman would say such a thing. A loon. A cosmonaut lost in the interstellar winds of insanity, hurtling untethered past sense and order. It’s just not a thing that can be sensibly argued, that this proud and lovely orphan automobile from a defunct carmaker is what all cars should be judged against or gauged by or compared to. Was it an extraordinary car? No. It was just a midsize car, complete with the expected sixes and eights. The Big Three picked up on midsize cars (a size of car between full-size cars and compact cars) in the mid ‘60s. This was after the independent little American carmakers started making midsizers in the late ‘50s, and after the mainstream carmakers started making compacts in the early ‘60s. The midsizers were like the full-sizers, but smaller, but they were also like the compacts, but bigger. They sold well, particularly for Plymouth. Nearly half of all Plymouths sold in the mid-’60s were midsized Satellites and the Belvedere upon which it was based. 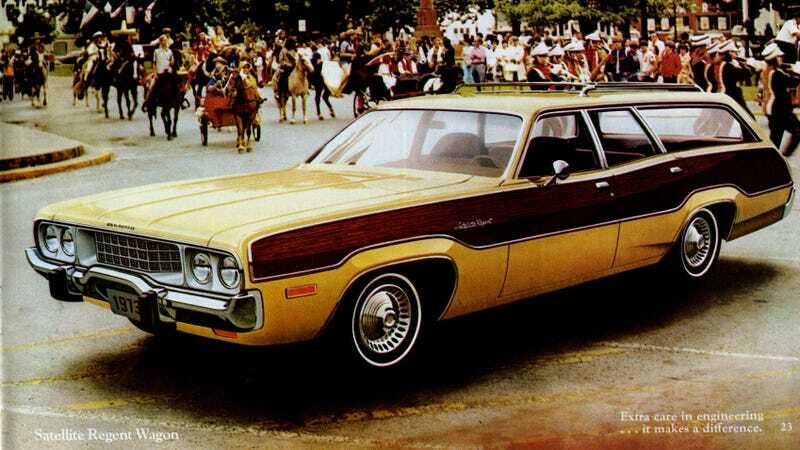 The Satellite in particular was often beloved for getting Plymouth’s classically weird look in the very late ‘60s and early ‘70s, and for getting big engines available in other Mopar products. Truly, very big engines were available in the Satellite. Many cars have engines. Some cars do not have engines. These engine-less cars are still cars. A book that has had all of the words erased is still a book, it is just a book that has all of its words erased. Some cars have been built without any engines at all, but this gets confusing as it’s not always obvious what an engine is, but that is a question for a different time. Engines as big as 440 cubic inches (that’s 7.2 liters) were available for the Plymouth Satellite in 1967. But none of this is to say that the Satellite was not a car. Certainly this car is a car. This Plymouth, the Satellite, I mean.